Dr. Flores has been part of the Mt. San Rafael Hospital team since 2006, and serves as a pediatric physician in our Rural Health Clinic. He also currently serves as Medical Director for the Rural Health Clinic and as Vice President of Medical Affairs for the Trinidad Area Health Association Board of Trustees. During his tenure at Mt. San Rafael Hospital and Clinic, Dr. Flores has served as a Board Member, Vice Chief of Staff, and Medical Staff Board Representative. 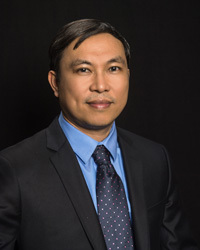 Dr. Flores received his bachelor's degree in biology from the University of the Philippines. Dr. Flores received his medical degree from the University of the Philippines located in Manila. He then completed his residency in pediatrics at Philippine General Hospital, also in Manila. Dr. Flores completed an additional residency in pediatrics at Mount Sinai School of Medicine within Elmhurst Hospital Center, located in Elmhurst, New York, where he also served as Chief Resident. Dr. Flores is fluent in Spanish and Filipino and is board certified in pediatrics. As a pediatrician, Dr. Flores believes in the importance of raising children while ensuring their healthy physical, mental and emotional development. He always emphasizes the value of immunization, good nutrition, education, and exercise in coordination with their personal beliefs. He also serves as an extended family member who can be a partner in medical decision-making. Dr. Flores has been practicing pediatrics in Trinidad for more than a decade. He has come to know the families he serves and has built mutual trust with them. Dr. Flores always encourages parents to be his partners in order to deliver high-quality and comprehensive care in a compassionate and professional manner. Dr. Flores enjoys working in Trinidad because he enjoys being part of the community he serves. He finds it very rewarding when he sees his patient families outside the clinic setting and gets the opportunity to talk to them as friends. Trinidad is a great place to be because it has a lot of wonderful outdoor activities to offer. It is a very friendly community and Dr. Flores and his family have always been accepted as part of the community. He and his wife, Dr. Sheryll Castro-Flores, together with their two children, enjoy the rural life. They enjoy the fresh air and being able to do simple things as a family.